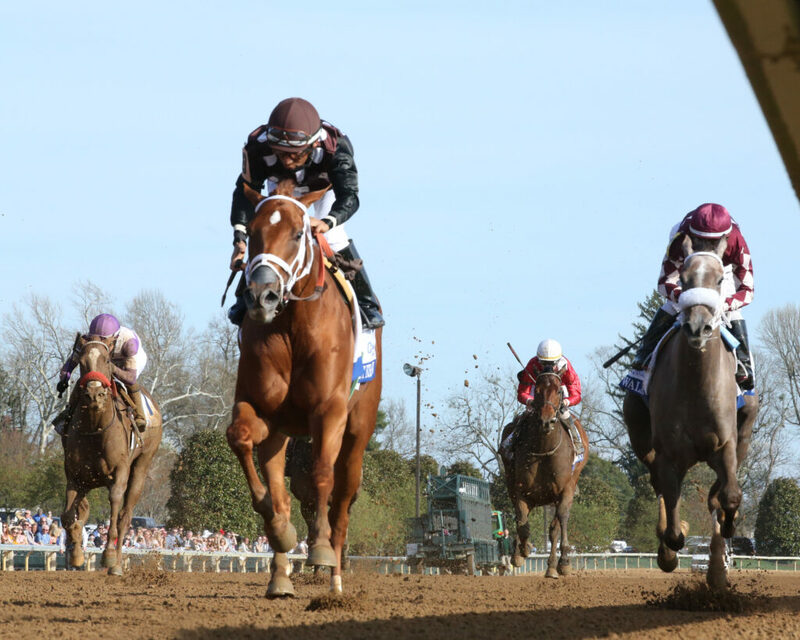 LEXINGTON, KY (April 6, 2019) – Commonwealth Stable’s Out for a Spin, the longest shot on the board at 52-1, turned back a challenge from Restless Rider in the stretch to win the 82nd running of the $500,000 Central Bank Ashland (G1) for 3-year-old fillies by a neck. Trained by Dallas Stewart and ridden by Paco Lopez, Out for a Spin covered the 1 1/16 miles on a fast main track in 1:44.95. It is the first victory in the race for Stewart and Lopez. The victory was worth $300,000 and 100 points on the road to the $1.25 million Kentucky Oaks (G1), to be run May 3 at Churchill Downs. A total of 34 fillies that have run in the Ashland have gone on to win the Oaks, including Monomoy Girl last year. Out for a Spin, whose two previous victories from four starts had come over wet tracks, tracked favored Jaywalk, the champion 2-year-old filly of 2018, through fractions of :23.19 and :46.46. On the far turn, Restless Rider ranged up to make it a three-way scramble before Jaywalk backed out of the fray. Restless Rider appeared to take aim on Out for a Spin, but with Lopez riding the rail, Out for a Spin surged again to prevail by a neck. Out for a Spin has 100 Oaks points, fifth on the leaderboard, and a secure spot in the starting gate for the 1 1/8-mile race that is limited to the top 14 point earners that pass the entry box. Restless Rider, making her 2019 debut, picked up 40 points to boost her total to 62 (eighth) that also should be enough to get in the gate. Third-place Jaywalk added 20 points to hike her total to 55 (10th). A Keeneland September Yearling Sale graduate, Out for a Spin is a Virginia-bred daughter of Hard Spun out of the Came Home mare My Mammy. 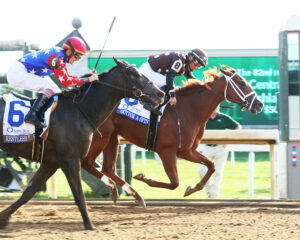 Now with a record of 5-3-0-1, Out for a Spin has earned $354,903. Out for a Spin returned $106.20, $23.40 and $6.60. Restless Rider, ridden by Brian Hernandez Jr., returned $4.20 and $2.60 and finished 1¾ lengths in front of 2018 2-year-old filly champion Jaywalk, who paid $2.60 to show under Javier Castellano. It was another 4¼ lengths back to Bizwhacks in fourth with Lady Kate, Chocolate Kisses and Bell’s the One following in order. Bizwhacks added 10 points to her Oaks resume for a total of 20 (23rd).